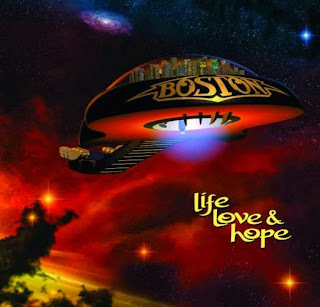 Boston have unveiled the cover artwork for “Life, Love & Hope”, the band’s first album in more than a decade that is set for release on December 3rd. The project includes lead vocals from Brad Delp, Tommy DeCarlo, Kimberley Dahme, David Victor and Tom Scholz, and features tracks with the classic Boston sound, as well as the latest in the evolution of Scholz' musical artistry. "I intentionally stayed close to the early Boston style on some of the songs, even using the same amps and instruments,” says Scholz, “on others I let my imagination run wild." "These are songs from the heart, each of them taking many months of effort to write, arrange, perform and record, always up to the demands of Boston's harshest critic, me,” added Scholz. “They have all been meticulously recorded to analogue tape on the same machines and equipment used for Boston's hits for the past 35 years." The 2013 edition of Boston features leader/guitarist Tom Scholz, guitarists Gary Pihl and David Victor, singer Tommy DeCarlo, bassist Tracy Ferrie and drummer Curly Smith.